I love dog movies, have you seen,“Beverly Hills Chihuahua” yet? It’s about a very pampered Chihuahua dog that suddenly has to give up her luxurious life and learn how to get along in a Mexican Desert. The movie has been on the top position of the US Box Office for some time now. It’s an entertaining and heart warming tale of one of the tiniest and most adorable of dogs. Right from the times of Lassie and Rin Tin Tin dog movies have always been very popular. The great Benji and the enormous Beethoven stole your hearts. One of the all-time classic dog films, a family favorite and a great cast, including Roddy McDowell and a very young Elizabeth Taylor. But, the real start of the film is the loyal collie dog named Lassie, determined to be reunited with her loving but poor family who were forced to sell her to a wealthy duke. This film helped kick off a series of Lassie films and a television show. Another classic dog movie is Old Yeller. The storyline is of a boy and a Mountain Cur dog that wandered onto the family's ranch and the bond the boy and dog share. In case you somehow missed this legendary dog film, I won't give away the ending, but you might want to have two boxes of tissues for this one- it's been known to even make grown men cry. Old Yeller was depicted as a Mountain Cur breed, the dog actually used in the movie was a yellow hound cross. Not too difficult to love that shaggy-haired mutt known as Benji. A town stray, Benji, gains respect when he helps find two kidnapped children and becomes a canine hero. Benji was played by a 15-year-old mixed breed thought to be terrier, poodle, and perhaps schnauzer and cocker spaniel as well. His name was Higgins, he was rescued from an animal shelter in L.A. This was the last film for Higgins, you can also see his antics in the classic television show Petticoat Junction. One of my favorite dog movies. The adventures of a golden retriever named Shadow, a bulldog named Chance, and a Himalayan cat named Sassy, the movie follows the unlikely trio's journey in which they hope to be reunited with their family. The 1993 Walt Disney version is a remake of the original film, entitled The Incredible Journey, and was released in 1963. 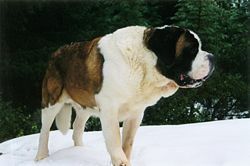 Starring a lovable, slobbering, 185 pound St. Bernard, Beethoven adopts a family, who loves the clumsy but loyal beast, except for the father, played by Charles Grodin. But Beethoven, having just escaped dognappers, ends up the target of an evil veterinarian who conducts animal experiments. The father ends up being Beethoven's last hope. This Walt Disney classic is a delightful family film. Featuring the unlikely romance of a purebred female cocker spaniel and a male mutt, the movie also includes one of animated film's most memorable scenes- when Lady and Tramp are dining on spaghetti at a restaurant and end up nibbling on the same strand, resulting in a sweet and tender kiss. Peggy Lee was the voice of the sinister Siamese cats. Another bit of trivia: this was the first feature length animated movie to be filmed in the widescreen format. Some of the most popular films ever made have starred dogs. I don’t expect “Beverly Hills Chihuahua” to top these classics but it was very enjoyable from my “Chihuahua Lover” point of view.